Diu is dotted all around green with palmyra, coconut, tamarisk and the hoka trees. The Portuguese had carried the hoka to India from Africa. The plantain, guava and custard apple trees are spotted all over the island. Fishing is the main livelihood of the people of Diu. Rum is also made of sugarcane. The outstanding Portuguese fort in Diu better known as the Fortem do Mar at the eastern tip of the island is the most arresting reminder of the times. Within the fortress walls you can see piles of old cannonballs, some of which are used as borders for the striking garden-beds in the fort's interior compound. 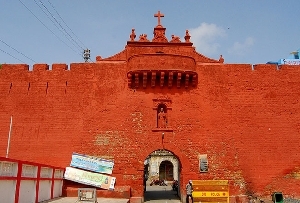 Portuguese Fort in Diu was constructed on the ruins of another fortress, built by the Arab Governor Malekhyaaz ­around 1400 AD, which in turn was built over a still earlier fort dating back to 700 AD. 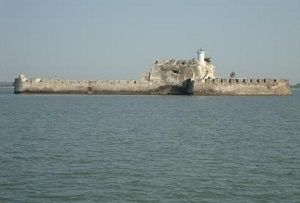 At the end of the Fort Road is the Portuguese Fort PraSa-de-Diu (29 m) built in 1535-41, standing like a guard on the east. In ravages of time, the Diu Portuguese Fort is now in ruins. A few cannon balls are scattered here and there. Above all, the last blow came when the Indian Army mounted Operation Vijoy in 1961. Just getting down from the bus, after crossing the Ghoghla bridge, you see the jetty ghat in front of you. The Tourist Office is on the left and the one km long Fort Road on the right. On the left of the road is the backwater of the Arabian Sea. The massive Portuguese fort in Diu is also flanked by a charming garden. On the right are series of hotels and houses. 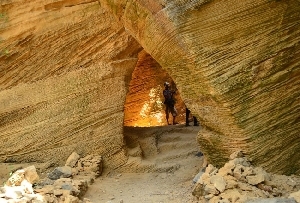 The fort commands a panoramic view of the Arabian Sea. The tourists love to take pictures from the fort of the exotic backwaters of Arabian Sea. From the Light House the view of the silent seas is beautiful. Recently a jail and a museum have been constructed. The Fort may be seen by visitors from 7-00—12-00 and again from 14-00—17-00 hr.